Scottsdale is 31 miles long and 11.4 miles wide at its widest point and shares boundaries with many other municipalities and entities. On the west, Scottsdale is bordered by Phoenix, Paradise Valley and unincorporated Maricopa County land. Carefree is located along the western boundary, as well as sharing Scottsdale’s northern boundary with the Tonto National Forest. To the south Scottsdale is bordered by Tempe. The southern boundary is also occupied by the Salt River Pima-Maricopa Indian Community, which extends along the eastern boundary, which also borders Fountain Hills, the McDowell Mountain Regional Park and more unincorporated Maricopa County land. According to the United States Census Bureau, the city has a total area of 184.4 square miles (478 km2), of which 184.2 square miles (477 km2) is land and 0.2 square miles (0.52 km2) (0.12%) is water. In 2005, the city’s annual Scottsdale Arts Festival was ranked the number-one such event in the US by American Style Magazine. The highest concentrations of galleries, studios and museums that are open to the public can be found in Downtown Scottsdale. It’s Scottsdale Arts District can be segmented into three distinct districts. The largest is the Scottsdale Main Street Arts District, home to the largest and most diverse collection of styles and genres, the more contemporary Marshall Way Arts District, and the more touristy and western-themed Old Town district, which has the Scottsdale Museum of Contemporary Art. The very popular Scottsdale Artwalk is held weekly, every Thursday evening. Scottsdale’s affluent culture has been depicted by shows such as MTV‘s My Super Sweet 16, which filmed an episode in the area in 2006, and by the short-lived CBS reality show Tuesday Night Book Club. “The West’s most western town” prides itself in its rich Western history, preserving while heavily promoting its plethora of “western” activities and events. The Scottsdale Arabian Horse Show has taken place since 1955. Today, the show attracts thousands of visitors and tourists, to see nearly 2000 purebred Arabian and Half-Arabian horses competing for various prizes and recognition. The show also features over 300 vendors and exhibitions, and over 25 demonstrations and shows. Perhaps, the most famous present-day “cowboy” event is the Scottsdale Jaycees Parada del Sol, an annual month-long event that has been held in Scottsdale since 1954. Originally named The Sunshine Festival, the PRCA Rodeo was added in 1956. Cowboys and cowgirls from across the nation converge in Scottsdale to participate in this cultural and historical event. The event begins each year with the Parada del Sol Parade, the world’s largest horse-drawn parade with over 150 entries in any given year. Since 1971, Scottsdale has been home to the Barrett-Jackson Auto Show. Due to the success of this week-long event held every January, the organizers behind it have more recently inaugurated similar but smaller shows in Palm Beach, Florida and Las Vegas, Nevada. Now held at the expansive West World exhibition complex in North Scottsdale, the event is an auto enthusiast’s and collector’s spectacle. The show is known for featuring both exotic, luxury automobiles and historic vehicles which have been expertly restored to mint condition. In what is considered to one of the longest continually running festival of its kind in the nation, the Scottsdale Culinary Festival is held annually during April. Though many of its individual events are held citywide, they concentrate in the downtown area. Entirely, it is estimated that the week-long festival draws over 40,000 people. The most heavily attended such event is the festival’s Great Arizona Picnic, an outdoor fair-like showcase of both well-known local and national chefs and restaurants. It is held on the lawn of the Scottsdale Civic Center Mall. The annual Scottsdale International Film Festival concentrates on the use of film to foster of the world’s cultures, lifestyles, religions, and ethnicities. Scottsdale is home to more than 125 professional art galleries and studios, one of the highest per-capita anywhere in the nation. The city has quickly become a center for art in the United States. According to the Scottsdale Convention & Visitor’s Bureau and American Style Magazine, the city has become one of the country’s largest art markets, usually only sharing ranks with New York City, New York and Santa Fe, New Mexico in terms of commerce generated as a direct result of art sales and purchasing. Scottsdale’s galleries and studios are most famous for their western and Native American themed art, though a growing devotion to the contemporary arts has taken hold over the past couple of decades – an element most visible by the large number of modern art galleries which have opened along the Marshall Way Arts District, and the opening of the Scottsdale Museum of Contemporary Art (also referred to as SMoCA) in 1999. Both are located in Downtown Scottsdale. Located in the Old Town district of Downtown Scottsdale, the Scottsdale Civic Center Mall is home to the two-theater Scottsdale Center for the Performing Arts, the Scottsdale Historical Museum, as well as the Scottsdale Museum of Contemporary Art. SMoCA is the only permanent museum dedicated solely to the contemporary arts in the state of Arizona. Also located in Old Town, Western Spirit: Scottsdale’s Museum of the West opened in January 2015, featuring historical and cultural exhibits from 19 states of the American West, including Arizona. 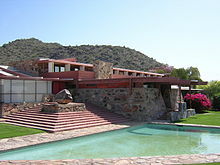 Taliesin West, famed architect Frank Lloyd Wright’s winter home and school from 1937 until 1959, is now one of the most popular tourist attractions in Arizona. The complex is located in the northeast fringe of the city, at the base of the McDowell Mountains. Scottdale is continually ranked as one of the premier golf and resort destinations in the world, with a sizable portion of tax revenue being derived from tourism. It is also home to the Phoenix Open Golf Tournament held at the Tournament Players Club every year. In all, the Scottsdale is home to more than 200 area courses offering layouts that range from the rolling green fairways of traditional courses, to desert golf designs. In 2006, the Robb Report cited Scottsdale as “America’s Best Place to Live for Golf.” The Boulders Resort & Golden Spa,, and Four Seasons Hotel|Four Seasons Resort Scottsdale at Troon North were selected in 2005 as the second and fourth best golf resorts in the nation by Travel + Leisure Golf magazine. Other golf courses in the area include FireRock, Troon North, The Phoenician, Silverleaf, and Desert Mountain.